For some people what they say means a lot, and so they don’t like going back on their word. They believe that their word is important and is a mark of their character, while others might not really focus much on the value of what they say or promise. 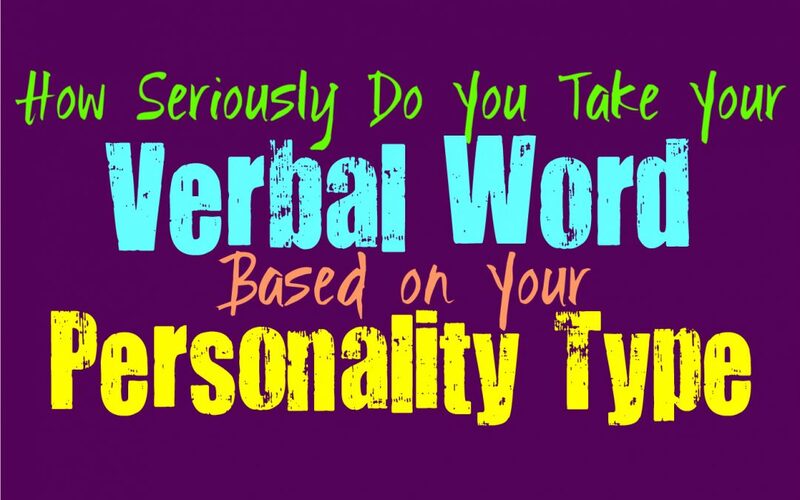 Here is how seriously you take your word, based on your personality type. INFJs believe that their word is truly important, and they don’t believe in going back on what they say. They have a hard time with people who don’t own up to their word, and will be unlikely to trust them. INFJs don’t like expressing something unless they mean it, or intend to follow through. When they express something they will do their best to stand by this, especially if it is something they have committed to. There are some ways in which the INFJ might contradict themselves, but this isn’t the same as going back on their word. ENFJs definitely believe that their word is important, and so they try their best to stand by this. When they express that they are going to do something the ENFJ will work hard to live up to this. There are times when things become overwhelming and the ENFJ might contradict themselves, but this isn’t something they intend to do. ENFJs have many layers to their personalities and so there can be times when they don’t always live up to certain things they say. INFPs definitely believe that their word is important, since they have such strong internal morals. INFPs believe that a strength of character is a truly important thing and so they strive to stand by what they say and express to others. INFPs have powerful convictions, and will do whatever it takes to live up to their word and promises. They might have moments where they reassess things, but most of the time the INFP is sure of what they have proclaimed and believe in. ENFPs certainly believe that their word is important, but there are times when they can go back on things they express. This simply happens because ENFPs follow their hearts which can sometimes lead them to changing their minds about certain things. They do their best to stand by their word and believe that what they say does matter. There are simply times when the ENFP questions their decisions and might need to reassess things in a different light. INTJs can have complex views of how valuable their word is, and just how important it is that they stand by certain things. When it comes to the people they care for and trust, INTJs will always do their best to stand by their word. They definitely mean what they say and won’t simply express something without intention and awareness. There might be times when the INTJ is in a competitive situation, and in these circumstances they can sometimes devalue the idea of expressing things in complete honesty. ENTJs do believe that it is important to strength of character and to stand by their convictions. They definitely value having a word that is something other people can trust and rely on. For ENTJs their word is important, and so they do their best to say what they mean and stand by their beliefs. There are some moments when they might not believe they need to fully express things to others, and might not entirely believe that their word is the most important thing in those moments. INTPs do believe that their word is important, but sometimes they contradict themselves in some ways. INTPs do sometimes change their views since they explore different options and don’t like being stuck in one way of thinking. They will often take the time to consider different options and sometimes this causes them to go back on their word with some beliefs. When it comes to their inner morals INTPs do their best to remain firm, but they just don’t like feeling narrow-minded. ENTPs don’t always say exactly what they mean, and so in some ways their word isn’t entirely something they value. For the ENTP it depends on who they are communicating with and what they are discussing. When it comes to their loved ones and expressing something serious and sincere, they will certainly believe in the value of standing by their word. When it comes to different situations they might just explore different beliefs and suggest things they don’t actually follow, just to see where it might lead. ISTJs certainly believe that their word is important, and so they do whatever it takes to stand by what they say. ISTJs don’t trust people who constantly go back on their word, and will have a hard time really valuing them as a friend or person. They prefer to be around people who are trustworthy and who believe that their word is something to be valued and held of a high importance. ESTJs definitely believe in the value of their word, and so they do their best to stand by what they say. When the ESTJ expresses something in a sincere and direct manner, they don’t simply go back on this. For them it is important to uphold a certain sense of dignity and moral integrity, and so they definitely strive to stand by their word. ESTJs want to be someone that others can rely on and see as someone to be trusted completely. ISFJs certainly believe in the value of someone’s word, and so they do their best to be someone others can trust. They work hard to uphold their own values and to stand by their loved ones no matter what. When the ISFJ makes a promise or says something, they do whatever they must to stand by this. There are times when they don’t always mean every detail of what they say though, since ISFJs want to avoid hurting people. For the ESFJ standing by their word is important, especially when it comes to their loved ones. There are times when they might not want to be someone that has to constantly uphold their word though, especially if they change their minds about something. For the ESFJ it depends on the circumstances and what they are trying to convey. They want to feel free to change their views about some things, especially over time. ISTPs don’t necessarily care much about their word, at least when it comes to strangers. They don’t feel like they are required to live up to the expectations of others, especially since they want to feel free to change their minds. ISTPs like to go with the flow and live their lives in the moment, which sometimes means changing their views and going back on their word occasionally. They will stand by the more important things that they express to their loved ones, but not every detail is vital to them. ESTPs believe that their word is important with some things, but with others not so much. When it comes to their loved ones they do their best to stand by what they say and always be there for them. There are certain things they don’t necessarily believe in standing by, since they can change their minds rather often. They don’t like having to follow every single thing they say, and want to feel free to change their minds sometimes. ISFPs do believe in standing by their word with the bigger things, since they do have strong inner morals. At the same time ISFPs follow their emotions in the moment, and so sometimes they can change their minds the last minute. The fact that they seem to change their minds and bounce to something else, means they can’t always express things in a firm manner and realize that sometimes things can change. ESFPs do believe in standing by their beliefs with the more important things and so their word is important. At the same time ESFPs don’t like having to follow a strict line and sometimes they change their minds last minute. They want to feel free to express something and not be forced to stand by this even if their feelings change later on. While they value upholding their moral beliefs, this doesn’t mean they want everything they say to be taken seriously.